Principal components are weighted linear combinations of the variables where the weights are chosen to account for the largest amount of variation in the data. The total number of principal components is the same as the number of input variables. It is based on the correlation or covariance matrix. The purpose of principal component analysis is to reduce the information in many variables into a set of weighted linear combinations of those variables. Each observed variable should be normally distributed. The relationship between all observed variables should be linear. The 'variance of each variable' is the diagonal values of the above matrix. It's covariance with itself. The diagonal values are 1.34. 0.62, 1.49. The sum of these values is 3.45 which is total variation. The total sum of eigenvalues is 3.45. The first eigenvalue shows 48% of total variance (= 1.65/3.45) is explained by first component. Similarly, the second component explains 35% of total variance. The cumulative proportion of variance by first two components is 83%. 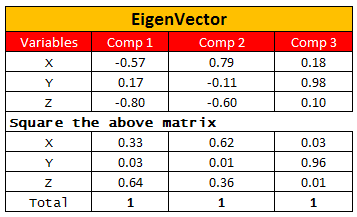 Eigenvector shows the correlation between component and variable. It explains which variable is highly correlated to a component. The squared value of eigenvector explains contribution of variable to a principal component. Hence, the sum of all values of a component is 1. 3. Choosing components with eigenvalue > 1 or cumulative proportion of variance more than 80%. In this case, we retain first two components. Eigenvalue : It represents the amount of variance accounted for by a component. Eigenvector (Loading) : It represents the weight of the component for each variable (for interpretation of the relative importance of the original variables). In other words, it tells the correlation between a variable and component. It is also called the coefficients of principal component score. Communality : It is the sum of the squared eigenvalues for all components for a given variable. It represents proportion of each variable's variance that can be explained by all the components jointly. If the communality for a variable is less than 50%, it is a candidate for exclusion from the analysis because the factor solution contains less that half of the variance in the original variable, and the explanatory power of that variable might be better represented by the individual variable. Orthogonal : Components are uncorrelated, i.e. no correlation between components. Oblique : Components are related, with some correlations. It is the component loading value which tells the correlations between a particular component and a variable. For each case, the component score is computed by multiplying the case's standardized variable values by the eigenvectors of each variables in the component (derived from standardized variables). Usage : These component scores could be used either as predictor variables or as criterion variables in subsequent analyses. For example : Three components are selected after running PCA. So, there will be 3 variables for each cases in the output file. It is important to make sure you standardize variables before running PCA. It is because PCA gives more weightage to those variables that have higher variances than to those variables that have very low variances. In effect the results of the analysis will depend on what units of measurement are used to measure each variable. Standardizing raw values makes equal variance so high weight is not assigned to variables having higher variances. By standardization, it means Z score i.e. (X - Sample_Mean)/Sample Stdev. With standardization, you may get more components as compared to without standardization. Eigenvalues over 1. Drop all components with eigenvalues under 1.0. Scree-plot: Plots eigenvalues. Where curvature changes. Retain enough components to explain some cumulative total percent of variance, usually 70% to 80%. Each observed variable contributes one unit of variance to the total variance in the data set. Any component that displays an eigenvalue greater than 1.0 is accounting for a greater amount of variance than was contributed by one variable. Such a component is therefore accounting for a meaningful amount of variance and is worthy of being retained. On the other hand, a component with an eigenvalue less than 1.0 is accounting for less variance than had been contributed by one variable. If you run a principal component analysis on a set of 5 variables and observe that the first component explains 85% of the variance. It means the variables are highly correlated to each other. In other words, variables are faced with multicollinearity. % of variance explained by first component is 84.45%. Each principal component involves all the input variables. The coefficients of the principal components—the eigenvectors—are usually non-zero for all the original input variables. This means that, if you use any principal components in the analysis—even one, you must retain all the original inputs. Also, the weights can be challenging to interpret. A variable can have high correlation with two components. It will lead to an ambiguous interpretation in analysis. The principal components can be used in place of the original variables in the analysis. Default Method : Based on Correlation Matrix. It should be used when variables are of different type. No need to standardize variables. COV : You can specify COV option to calculate principal based on covariance matrix. It should be used when variables are of same type. Using the correlation matrix is equivalent to using the covariance matrix of standardized observations. OUT= : It creates an output SAS data set that contains all the original data as well as the principal component scores. OUTSTAT= : It creates an output SAS data set that contains means, standard deviations, number of observations, correlations or covariances, eigenvalues, and eigenvectors. /* Reducing a set of variables (vars) using PCA, by keeping fraction p (p<=1) of the variance. 2 Responses to "Principal Component Analysis with SAS"
Hi Deepanshu, I am using varclus and PCA in SAS to reduce number of variables. Is there any take on which technique is better than other and why? Also, is there anything else I can use?